Growing up, one of the first desserts I've ever made for my family was a cheesecake. It's my dad's favorite dessert and one my mom enjoys because it's not particularly too sweet. The very first recipe I tried was one from a little paperback cheesecake recipe booklet I bought for $1. It highlighted recipes using Borden/Eagle Brand sweetened condensed milk. My family loved my first cheesecake and often request it on special occasions. It's the one cheesecake recipe that I love using time and time again after all these years. First off, it's easy. If I had success with it as a teenager, anyone can make a cheesecake! Secondly, it's a great base recipe that you can play with by incorporating other flavors and ingredients. And third, it's amazingly delicious... a truly fail-proof recipe. For the crust, you can make a traditional graham cracker crust. I used gluten free graham crackers - if you're gluten free and come across these, snag them and an extra one too! They make for a great pantry staple for those who are gluten free. Prepare the crust in the bottom of a springform pan. The filling is where the magic happens. A couple bricks of cream cheese, a few whole eggs, a little freshly squeezed lemon juice and a can of sweetened condensed milk are blended together. The mixture is poured into the springform pan on top of the prepared crust. Bake this beauty up in a preheated oven, uncovered and without any water bath for a little less than an hour... and it comes out perfect every.single.time. 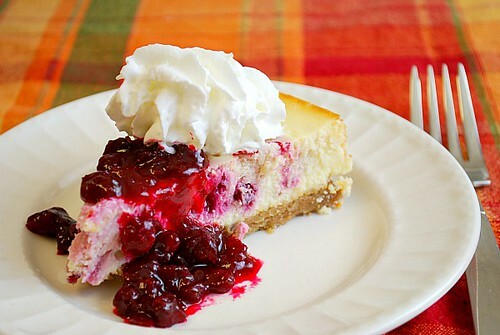 Dollop spoonfulls of the cranberry sauce randomly over the top of the cheesecake filling. 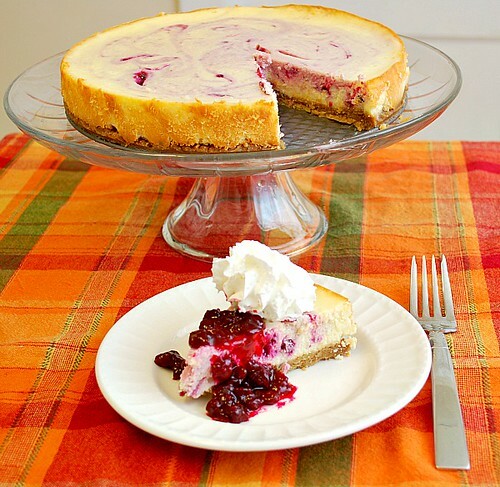 Using the tip of a paring knife, drag the knife across the cheesecake filling to swirl the cranberry sauce into it. Bake the cheesecake in the preheated oven uncovered for 50 to 55 minutes or until set. Cool for an hour to finish setting, chill for another hour before serving. 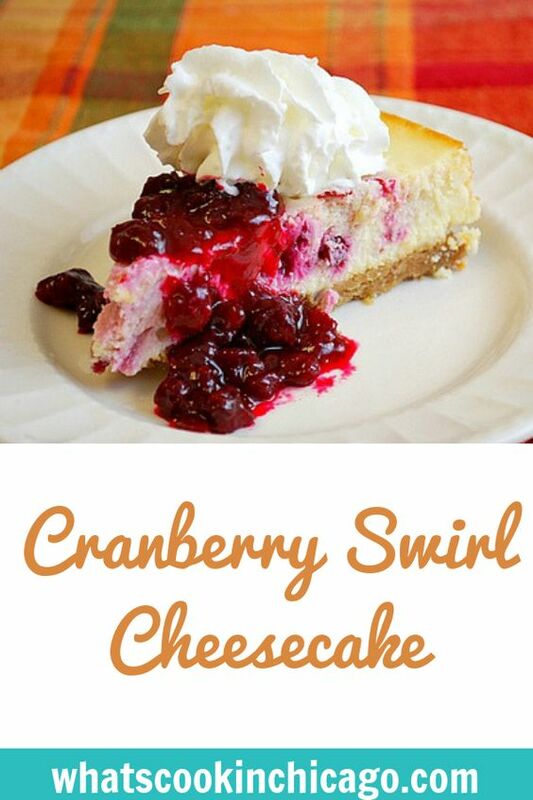 Serve by garnishing with whipped cream and extra cranberry sauce if desired.